China was the first country in the world that has approved commercial gene therapy products. The first product was called Gendicine. In the western world the first approved gene therapy product was Glybera in 2012. Below is a summary of gene therapy products that are world wide on the market. Please note that the list is not exhaustive. In Europe, gene therapy products have to be approved by the European Medicines Agency (EMA) which is the European agency for the evaluation of medicinal products, including gene therapy medicinal products. Gene therapy products are regarded as dvanced therapy medicinal products (ATMPs). In the end, the gene therapy products needs to be approved by the European Commission. In the United States, gene therapy products need approval by the U.S. Food and Drug Administration (FDA). China's medicines authority (China State Food & Drug Administration, SDFA) approved the cancer therapy after it achieved promising results in a clinical trial on October 16, 2003. The treatment, called Gendicine, has been launched commercially by SiBiono GeneTech Co. of Shenzhen, Guangdong province. Gendicine was approved for the treatment of head and neck squamous cell carcinoma. The gene therapy product is an adenovirus vector carrying the p53 tumour-suppressor gene. Gendicine is similar to Advexin developed by the Texas-based Introgen Therapeutics. Advexin is still waiting for FDA approval. Gendicine enters the tumour cells by way of receptor-mediated endocytosis and begins to over-express genes coding for the p53 protein needed to fight the tumour. Ad-p53 seems to act by stimulating the apoptotic pathway in tumour cells, which increases the expression of tumour suppressor genes and immune response factors (such as the ability of natural killer (NK) cells to exert "bystander" effects). It also decreases the expression of multi-drug resistance, vascular endothelial growth factor and matrix metalloproteinase-2 genes and blocking transcriptional survival signals. p53 mutation status of the tumour cells and response to Ad-p53 treatment are not closely correlated. Ad-p53 appears to act synergistically with conventional treatments such as chemo- and radiotherapy. This synergy still exists in patients with chemotherapy and radiotherapy-resistant tumors. Gendicine produces fewer side effects than conventional therapy. Shanghai Sunway Biotech Co. Ltd. announced in November 2005 that the SFDA has approved Oncorine (H101), an oncolytic adenovirus, to be used in combination with chemotherapy as a treatment for patients with late stage refractory nasopharyngeal cancer. This marks the first oncolytic viral therapy approved by any regulatory agency in the world and this is the second commercial gene therapy product. H101 is essentially a modified version of Onyx-015, initially developed by Onyx Pharmaceuticals. Besides Oncorine, Shanghai Sunway Biotech develops a tumor-targeted recombinant adenovirus injection (H102) and an oncolytic recombinant adenovirus injection (H103) for treatment of cancer. H102 specifically targets primary hepatocellular carcinoma. H103 adenoviruses lyses the tumor cells and expresses Hsp70 that can potently stimulate an antitumor immune response. - Gene Therapy in China - From a Dutch perspective (2010). This study was initiated by The Netherlands Commission on Genetic Modification (COGEM) to retrieve information from Chinese sources, esp. Chinese literature databases, Chinese scientists, scientific meetings in China, on gene therapy developments and risk assessment. 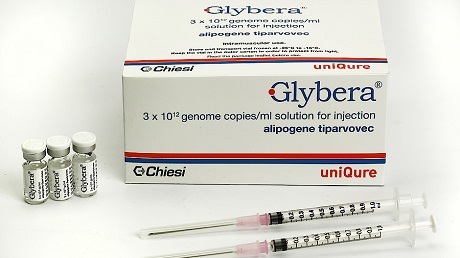 Glybera (Alipogene tiparvovec) is a gene therapy treatment designed to reverse lipoprotein lipase deficiency (LPLD), a rare inherited disorder which can cause severe pancreatitis. Glybera is composed of an adeno-associated virus serotype 1 (AAV1) viral vector with an intact copy of the human lipoprotein lipase (LPL) gene for delivery to muscle cells. Data from the clinical trials indicates that fat concentrations in blood were reduced between 3 and 12 weeks after injection, in nearly all patients. In July 2012, the European Medicines Agency (EMA) recommended it for approval (the first recommendation for a gene therapy treatment in either Europe or the United States), and the recommendation was endorsed by the European Commission in November 2012. Glybera was developed over a period of decades by researchers at the University of British Columbia and later Amsterdam Molecular Therapeutics (AMT), which acquired rights to with the aim of releasing the drug in Europe. After spending millions of euros on Glybera's approval, AMT went bankrupt and its assets were acquired by uniQure. Glybera gained infamy as the "million-dollar drug," causing its manufacturer, uniQure, to remove the drug after two years on the European market. As of 2018, only 31 people worldwide have ever been administered Glybera, and uniQure has no plans to sell the drug in the US or Canada. Imlygic (talimogene laherparepvec) is a genetically modified herpes virus used to treat melanoma. Imlygic was approved by the FDA at October 27, 2015 and by the EMA at December 17, 2015. It was originally developed by BioVex and continued by Amgen after the acquisition of BioVex by Amgen in 2011. Although melanomas shrink due to Imygic, there is no statistically significant benefit in overall survival. In other words, Imlygic does not extend lifes of patients with melanoma. The lack of benefits in combination with the price tag of approximately $65,000 makes Imlygic unpopular to prescribe for doctors. Imlygic is an oncolytic viral therapy with attenuated life herpes simplex virus type 1 (HSV-1). In HSV-1, two genes are removed and one gene is added. The genes who are removed originally code for the proteins infected cell protein 34.5 (ICP34.5) and infected cell protein 47 (ICP47). ICP34.5 blocks the response of healthy cells to stop replicating and die after viral infection. However, cancer cells lack this system. By removing ICP34.5, HSV-1 cannot replicate and kill normal cells, but in cancer cells they can. ICP47 suppresses an immune response to viral infection. Removing ICP47 should trigger an immune response, in theory. A gene coding for granulocyte colony-stimulating factor (GM-CSF) is inserted to promote an immune response to cancer cells infected by Imlygic. Despite these efforts, clinical evidence for an immune response to cancer cells due to Imlygic is not available. Zalmoxis is a medicine used as an add-on treatment in adults who have received a haematopoietic stem cell transplant (HSCT, a transplant of cells that can develop into different types of blood cells) from a partially matched donor (a so-called haploidentical transplant). Zalmoxis is used in patients who have received a haploidentical HSCT because they have serious blood cancers, such as certain leukaemias and lymphomas. Before receiving an HSCT, the patient will have received treatment to remove existing cells from the bone marrow, including cancer cells and immune cells. Zalmoxis is given to help restore the patient’s immune system after the transplant. The product is composed of allogeneic T cells genetically modified with a retroviral vector encoding for a truncated form of the human low affinity nerve growth factor receptor (ΔLNGFR) and the herpes simplex I virus thymidine kinase (HSV-TK Mut2). Zalmoxis is a type of advanced therapy medicine called a ‘somatic cell therapy product’. This is a type of medicine containing cells or tissues that have been manipulated so that they can be used to cure, diagnose or prevent a disease. Zalmoxis contains T cells (a type of white blood cell) that have been genetically modified1. To make Zalmoxis, T cells from the HSCT donor are separated from the rest of the cells in the transplant. These T cells are then genetically modified to include a ‘suicide gene’. Because the number of patients undergoing haploidentical HSCT is low, Zalmoxis was designated an ‘orphan medicine’ (a medicine used in rare diseases) on 20 October 2003 by the EMA. Zalmoxis is developed by MolMed S.p.A and the product has been given ‘conditional approval’ by the European Medicines Agency (EMA) in September 2016. This means that there is more evidence to come about the medicine, which the company is required to provide. 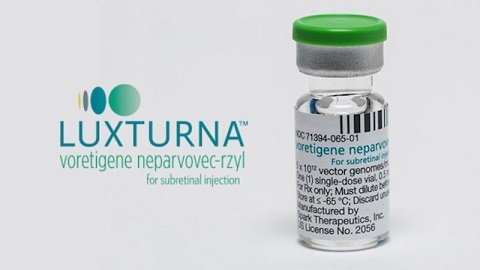 Luxturna (voretigene neparvovec-rzyl) is currently the only approved gene therapy available in the US. It is the first medication approved for an inherited genetic disease ever. Luxturna was approved by the FDA at December 19, 2017 for the United States and it is currently under supervision at the EMA for approval in Europe. It is developed by by Spark Therapeutics and Children's Hospital of Philadelphia, and outlicensed commercial rights outside the United States to Novartis. The first commercial sale (the first for any gene therapy product in the US) occurred in March 2018. In September 2018, the European Medicines Agency's (EMA) has recommended granting a marketing authorisation for Luxturna. Luxturna is used for patients with an inherited form of retinal dystrophy. Retinal dystrophy is an umbrella term for a wide range of progressive eye diseases. ‘Retinal’ means that the condition is related to the retina, which is the back layer of the eye which converts light into an understandable message to the brain. ‘Dystrophy’ is a degenerative condition. Retinal dystrophy causes progressive reduction or deterioration of vision which eventually can result in complete blindness. Luxturna can be used for patients who have mutations in the RPE65 gene in both chromosomes. Luxturna is an adeno-associated virus type 2 (AAV2)-based treatment where the correct copy of the RPE65 gene is delivered without disturbing the genome. Luxturna is injected directly into the retina so it can infect the retinal cells. When RPE65 is expressed in those cells, it can perform its function and in principle, halt the progression of the disease. Tisagenlecleucel, marketed as Kymriah, is a treatment for B-cell acute lymphoblastic leukemia (ALL) which uses the body's own T cells to fight cancer (adoptive cell transfer). T cells from a person with cancer are removed, genetically engineered to make a specific chimeric cell surface receptor with components from both a T-cell receptor and an antibody specific to a protein on the cancer cell, and transferred back to the person. The T cells are engineered to target a protein called CD19 that is common on B cells. A chimeric T cell receptor ("CAR-T") is expressed on the surface of the T cell. It was invented and initially developed at the University of Pennsylvania; Novartis completed development, obtained FDA approval, and markets the treatment. In August 2017, it became the first FDA-approved treatment that included a gene therapy step in the United States. In May 2018, the FDA further approved Kymriah to treat adults with relapsed or refractory diffuse large B-cell lymphoma. In June 2018, The European Medicines Agency (EMA) has recommended marketing authorization of Kymriah. On August 27, 2018, the European Commission has approved Kymriah for the treatment of pediatric and young adult patients up to 25 years of age with B-cell acute lymphoblastic leukemia (ALL) that is refractory, in relapse post-transplant or in second or later relapse; and for the treatment of adult patients with relapsed or refractory (r/r) diffuse large B-cell lymphoma (DLBCL) after two or more lines of systemic therapy. Yescarta (axicabtagene ciloleucel) is a treatment for large B-cell lymphoma that has failed conventional treatment. T cells are removed from a person with lymphoma and genetically engineered to produce a specific T-cell receptor. The resulting chimeric antigen receptor T cells or "CAR-Ts" that react to the cancer are then given back to the person to populate the bone marrow. The T-cells are engineered to target CD19 receptors on the cancerous B cells. Yescarta was developed by biotech company Kite Pharma, which was acquired by Gilead Sciences in an $11.9 billion deal in August 2017. Based on the ZUMA-1 trial, Kite submitted to the FDA a biologics license application for Yescarta in March 2017 for the treatment of Non-Hodgkin lymphoma. The FDA granted approval on October 18, 2017 for the second-line treatment of diffuse large B-cell lymphoma. In June 2018, The European Medicines Agency (EMA) has recommended marketing approval of Yescarta. On August 27, 2018, the European Commission granted marketing authorization for Yescarta as a treatment for adult patients with relapsed or refractory diffuse large B-cell lymphoma (DLBCL) and primary mediastinal large B-cell lymphoma (PMBCL), after two or more lines of systemic therapy.